A pothole developed Nov. 30 after a winter storm blew threw Manhattan. Thawing afterward created this pothole on a city street. City of MHK Courtesy photo. MANHATTAN — Despite frigid conditions this winter, the city of Manhattan has gotten by with minimal impacts to the city’s water system. Water main breaks can be more common in the winter months in extreme cold, given the age of the infrastructure. Manhattan Assistant Public Works Director Randy DeWitt says fluctuating weather conditions can impact underground utilities. Other cities across the region, such as Topeka and Emporia have already battled multiple water main breaks this season. 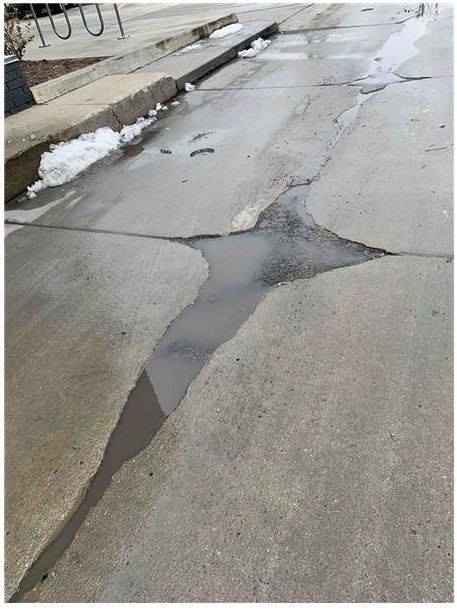 Thawing after a winter storm can also wreak havoc on city streets in the form of potholes like the one in the above photo from late November. Potholes can be reported to city officials via the Report It! smart phone app available for Android and iPhone. As for private home water lines, DeWitt says steps should be taken to ensure those don’t freeze. DeWitt says typically breaks in private service lines occur when a resident leaves for an extended period of time. That’s especially true in Manhattan. If you do plan to be away from your home, it’s suggested you leave your furnace running to avoid any ruptures to your pipes. If a widespread water main rupture occurs in Manhattan, DeWitt says residents will be notified. Temperatures will continue to be in the single digits to teens through much of the weekend with wind chills dropping below zero at times. The post Manhattan Public Works says infrastructure holding up well against Mother Nature appeared first on News Radio KMAN.